as hard as I try … it’s simply hard to not get caught up in the emotion/hope and chaos of the IPO. WE ARE ALL HUMAN! Let’s face it … FACEBOOK has changed the game. I spent last week at the Mid Atlantic Digital Marketing Summit and I was blown away by digital media and the incredible connected nature of our being – right here, right now. WOW … and, guess what, Facebook did it ….AWESOME! Well, as you my faithful readers know …it didn’t call a top in the market…. 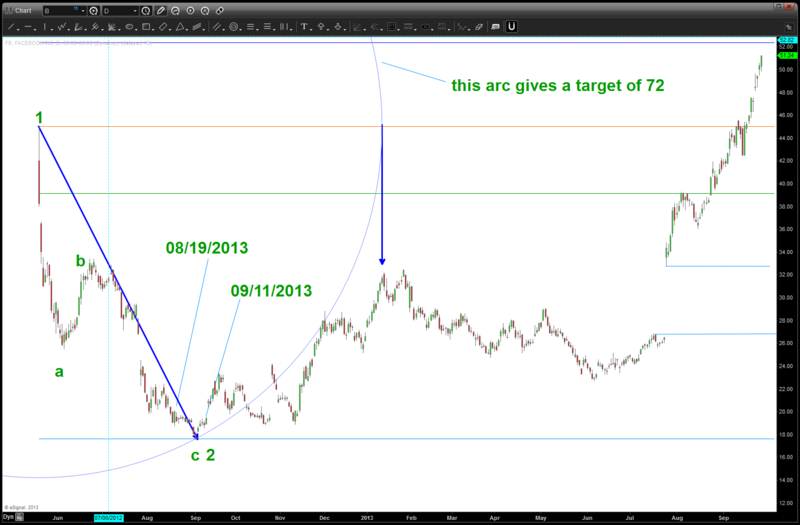 FB target is, essentially hit…. STOP OUT IF WE HAVE A DAILY CLOSE BELOW 14 …..
V50 Capital Management, LLC provides investment management and signal services for Commodities, Options and Forex investments. Note: Commodities, Options and Forex trading involves substantial risk, and may not be suitable for everyone; trading in these markets should only be done with true risk capital. Past performance either actual or hypothetical is not indicative of future performance. Here is the current chart w/ the dates annotated …..
nothing more to say …. great patterns/off FB goes …..